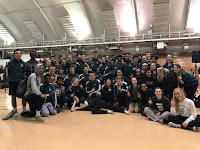 Two months of hard work and competition was rewarded Tuesday night as the Madison Memorial boy & girls track & field teams BOTH defended their Indoor City Championship. The boys team amassed 125 points holding off a close challenge by LaFollette who scored 111points. While the girls dominated again scoring 135 points easily outdistancing LaFollette 2nd place total of 94 points. Both squads competed admirably on a cool and overcast night against the best in the city of Madison. This was a great kick off for both teams as they head into the championship stretch of the season. Hopefully the Frosh & JV teams can repeat this type of performance on Wednesday evening.